I love this show. I do like it better when the claws come out, but I didn't really feel the tension like usual. Unfortunate. Or maybe it was because the fighting was spread out between Blake, Adam and Christina and not just Christina and Adam. Cee Lo, as usual, sat with his giant sun glasses on and said semi-creepy things to the people he turned around for and nothing for others. There were a couple of interesting people who sang tonight. Alicia Keys' backup singer sang Avril Lavigne's Complicated...and people turned around for him. He was ok, but seriously. There was a guy who looked like Gavin DeGraw that sang a Gavin DeGraw song...he did not get picked. The army girl who sang Rollin In the Deep at the army base that went viral sang Heartbreaker...it was not as good as her Adele cover. Cee Lo is the only one who turns around for her and he might have scored his lucky break...cause she will definitely have votes. There was a guy girl duo...the guy is totally into the girl. They sang country and all the judges turned around. They were country so the obvious choice is Blake, but then we see who is chasing whom and they go with Christina. The guy is so obviously whipped. 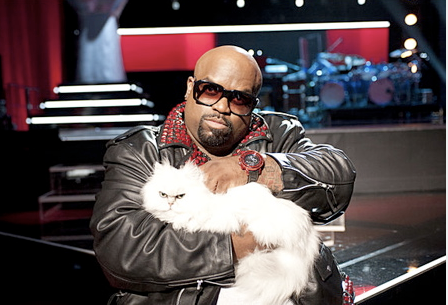 None of the performances or the judges tiffs compared at all to Cee Lo's cat. I don't know where the hell it came from or why has holds it in his solo camera moments, but damn it is hilarious. I stopped trying to figure out why Cee Lo does anything that he does after he wore giant red sunglasses with a red t-shirt and shorts to one of the episodes last season. I felt like a was looking at my 80 year old grandma trying to look legit. So epic. That picture of Cee Lo and his cat has made my day! Now I'm going to go to work and only dream of the comedy it would be to sit at my desk and have a cat randomly appear.